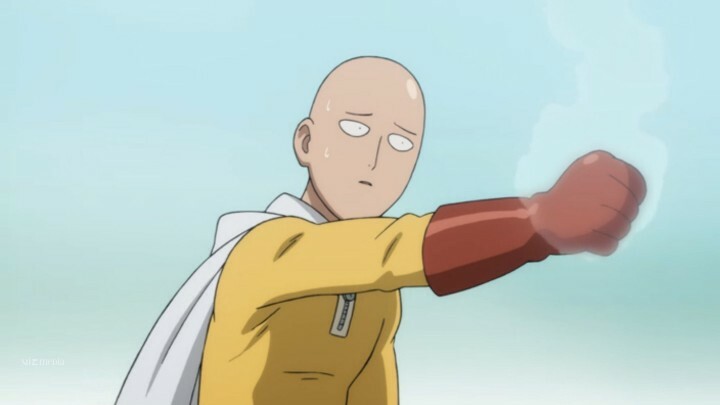 One Punch Man is the 2015 anime adaptation of the 2012 manga by the same name, which was itself an adaptation of a popular web comic that began in 2009. Even with so many adaptations however, the spirit of the series is constant. 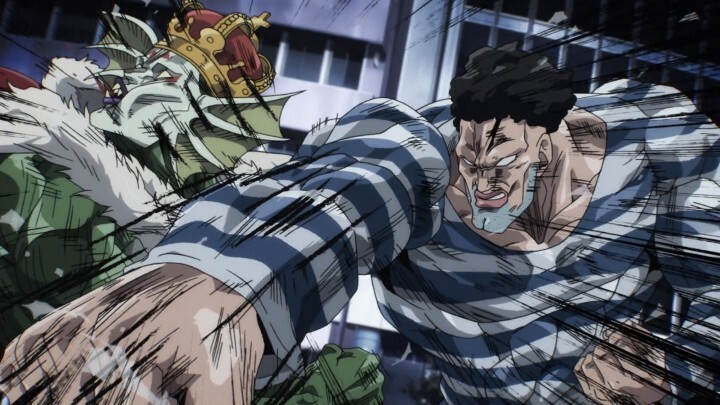 Madhouse, the anime production company perhaps most famous for its adaptations of Death Note and Hunter x Hunter, delivers a masterful anime that was, in many ways, the sleeper hit of the Fall 2015 anime season. Thus, it’s not even a spoiler to tell you that Saitama wins every single one of his fights in this series — but then again, that’s not the point of this anime. The fights are beautifully animated with breathtaking detail and awe-inspiring speed, but they aren’t the point of this show. 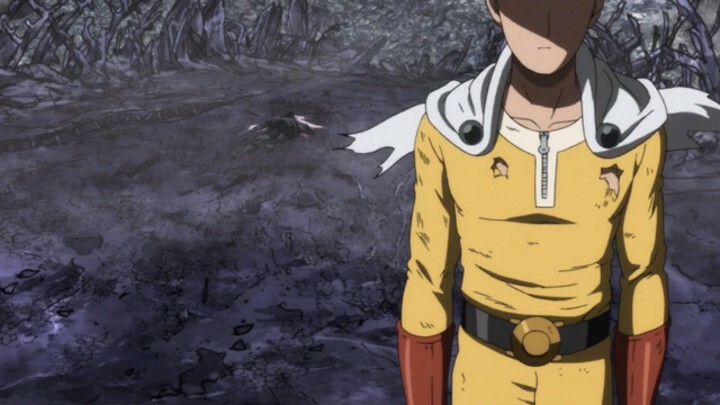 One Punch Man isn’t the tale of a typical shounen anime protagonist like Goku or Naruto; rather, Saitama is the shounen protagonist taken to its absurd extreme. This is a tale about a man so powerful that he’s bored and even downright depressed because he just wants to have fun fighting. And ultimately, this show dives more deeply into what it truly means to be a “hero” than any other series it’s meant to parody. Right off the bat, we’re thrown into the midst of a monster attack in City Z, one that Saitama easily dispatches with a single punch. However, what’s truly entertaining about this fight — and the others that follow throughout the series — is the nonchalant manner in which Saitama engages his opponent. His face is completely subdued in utter boredom as his enemies monologue about their origin story or their incredible power. This clues us into the most important aspect of this series: its absolute parody and satire of typical shounen anime tropes and expectations. In a typical shounen anime, which Dragon Ball Z perhaps epitomizes, the hero is someone of lowly upbringing who is either unknowingly destined to save the world or overcomes any obstacle in his way through sheer perseverance — and a training arc or two. Saitama is neither of these things. As he tells the audience in the very first episode, he’s a “hero for fun,” because he was bored with his old job. 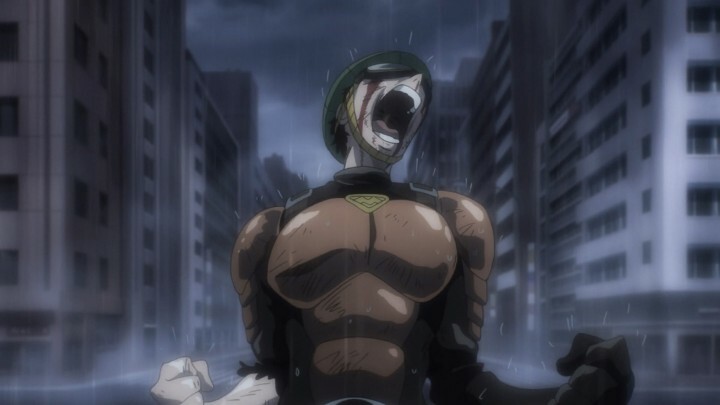 One Punch Man defies nearly every expectation of an anime protagonist. What he didn’t anticipate, however, is the fact that the never-ending adventure of being a hero could also become boring, because he’s simply too powerful for fights to last any longer than a few seconds. Saitama is like Goku, if Goku was utterly bored with the universe and fell into a deep melancholy because he realized that he was the star of his own show and would never be defeated. We, as anime fans, have all these expectations of what an anime protagonist should be, and One Punch Man defies nearly every one of them. When the android Genos comes to town and is nearly defeated by a powerful foe, Saitama again dispatches the mosquito woman with a single blow, earning him the admiration of the android. And when Saitama and his newfound apprentice invade the home base of an evil organization, we find that Saitama again plays with our expectations as anime fans. Rather than having trained for years on end in a “hyperbolic time chamber” or having a demon fox implanted in him at birth, Saitama seemingly gained his incredible strength from a standard fitness regime. There’s little in the way of critiques to offer this first act, as it delivers the typical first story arc of a shounen anime by defying every single story trope typically associated with the genre. We don’t get a “beginner” villain who acts as the proving ground for the hero, or an incredible origin story, or even an obstacle of any kind as our hero struggles to prove himself. 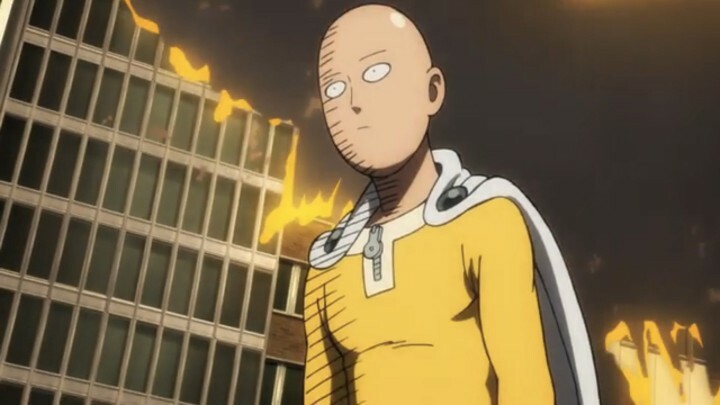 Instead, we simply get the melancholic hero-for-fun Saitama. And what’s even stranger is that it’s so incredible to watch, primarily because the show is so intent on dismantling many of the clichés and stereotypes its audience grew up with. It also doesn’t hurt that Madhouse delivers some of the finest fighting animation I’ve ever seen; it’s especially neat to watch Saitama’s face as he gets more and more serious, only to be disappointed when his own strength robs him of any fun a fight could have provided. 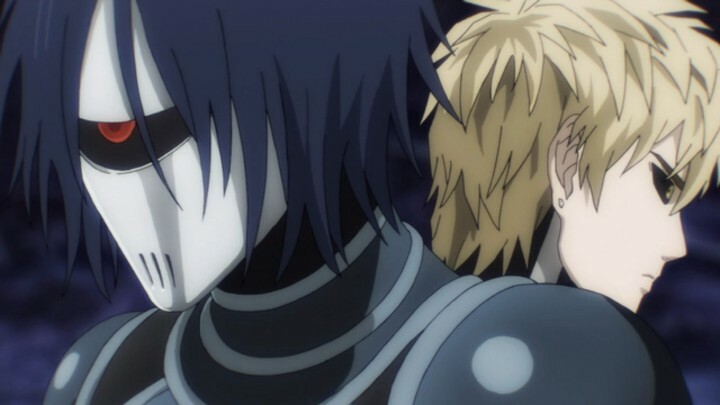 Following another short-lived bout, Saitama and Genos decide to join the “Hero Association,” a literal bureaucratic organization that officially licenses and ranks heroes. It’s during this rating process that our expectations are again played with to humorous effect. In another anime, the hero might have been placed in the B-Class or lower because they have a ladder to climb which represents their growth throughout the series. Instead, Saitama finds himself in the C-Class because his written evaluations were so poor. But, this ironic situation ends up being one of the greatest obstacles in the series! With his battles being so brief, Saitama’s skills and name are largely unknown to the Association or the people at large, leaving him once again the victim of his own power. This newfound bout of melancholy leads Saitama to hunt down common criminals on the street in an attempt to climb the rankings. But even then, his continued successes lead him to even greater internal suffering. No matter how great his accomplishments, Saitama’s strength is so unimaginable and yet so simple that people literally cannot comprehend him as a great hero and even accuse him of cheating. 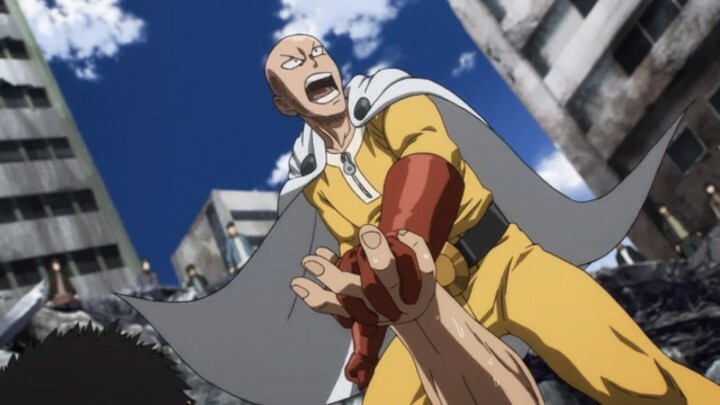 But, for me, this was one of the moments where Saitama truly deserved the title “hero,” especially when he declares to a group of hecklers that he doesn’t care what they think about him; he’s a hero because he wants to be. This is further elaborated on in the next arc, which I believe to be the series emotional high point. This third arc is the shortest of the series, and it’s really just a two-part conflict with the “Deep Sea King,” a terribly powerful monster that dominates all who test his strength, including highly ranked A-Class heroes. Ultimately though, it’s not the strength of this new foe that makes this arc an incredible one; in fact, it has little to do with physical strength at all. Rather, this arc exemplifies the sort of internal strength that’s necessary to call oneself a hero and delivers one of the finest lessons a shounen anime has ever left me with. This arc delivers one of the finest lessons a shounen anime has ever left me with. Throughout the arc, as many heroes fall to the Deep Sea King, including the S-Class hero Puri-Puri Prisoner, we’re constantly shown the struggle of C-Class hero Mumen Rider as he furiously tries to join the battle on his bicycle despite the Association telling him to run. And when all other heroes aside from Rider and Saitama are knocked out, it’s really just this lone hero atop a bicycle that dares to stand up to the monstrous King. The weird part about it is that we all know the result of this fight going into it, just as we know what will happen when Saitama inevitably fights the Deep Sea King, but it doesn’t matter. Again, as anime fans we’ve grown to expect that the hero is the guy that wins, the guy that beats the monster and saves the day. But One Punch Man, an anime featuring perhaps the most overpowered protagonist of any shounen, ironically shows us the error of that expectation. A hero doesn’t have to be the “chosen one” or the last of some great alien race or even someone who trains harder than anyone else; a hero can be anyone, even a bicycle rider. And the fact that I was able to write that last sentence about anime is a strange testament to the undeniable appeal of this series to ardent anime fans. Even though this arc is the weakest of the series, it’s still quite good. The animation continues to impress, as does the series’ habit of defying expectations. 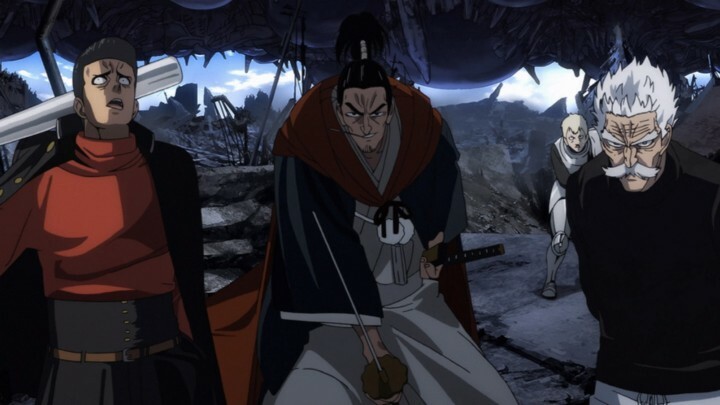 However, this arc is where the weaknesses of being an adaptation start to show, as tensions climb and conflicts arise for seemingly little reason. Even so, One Punch Man’s conclusion delivers one of the most hyped and wonderfully animated fights in recent memory. This show is definitely not afraid to be weird. When the S-Class heroes (and Saitama) gather at the Hero Association headquarters to discuss a potentially world-ending threat, we’re introduced to more characters than I can even remember. There are certainly a few standouts, including a samurai hero, a guy who literally swings a metal baseball bat, and a guy dressed in a dog costume — yeah, this show is definitely not afraid to be weird. 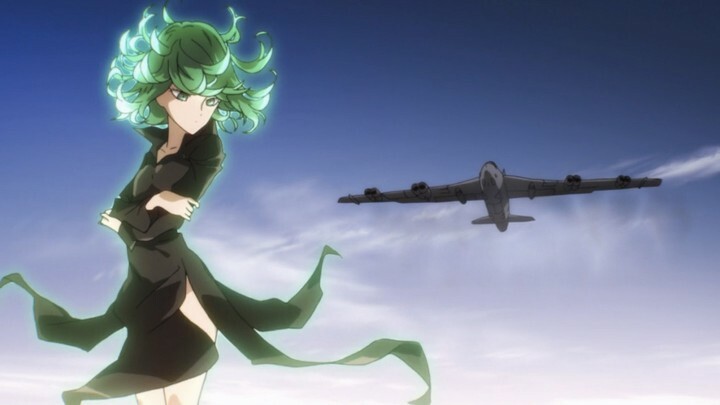 For me, however, the real star of this arc is the “Tornado of Terror,” Tatsumaki, a psychic woman whose diminutive size belies the fact that she’s actually older than Saitama and Genos and incredibly powerful in her own right. Anytime she takes the stage, she easily dominates the scene she’s in, like when she rips a meteor from outer space with her telekenetic power; and anyone who even remotely reminds me of Madara Uchiha from Naruto gets cool points in my book. Her aside though, it’s odd to introduce so many characters so late in a series like this, especially when it can only focus on a few of them at a time — some are bound to receive little to no screen time. 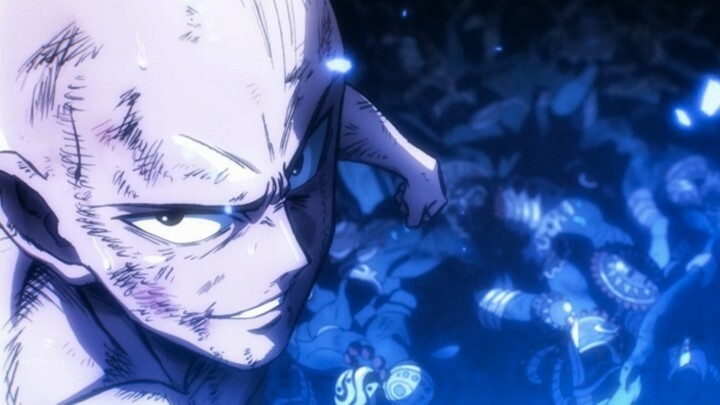 As an alien invasion interrupts the meeting and the Hero Association struggles with how to counterattack this new foe, Saitama forces his way onto the lone invading ship in search of what he believes will be a worthy opponent. Meanwhile, the various other heroes intercept another alien enemy on the ground, providing one of the most even-handed fights of the whole series. Even so, this concluding arc isn’t perfect. In addition to the aforementioned cast of characters that do very little in this battle, there are also numerous sub-plots that appear out of nowhere and go nowhere. 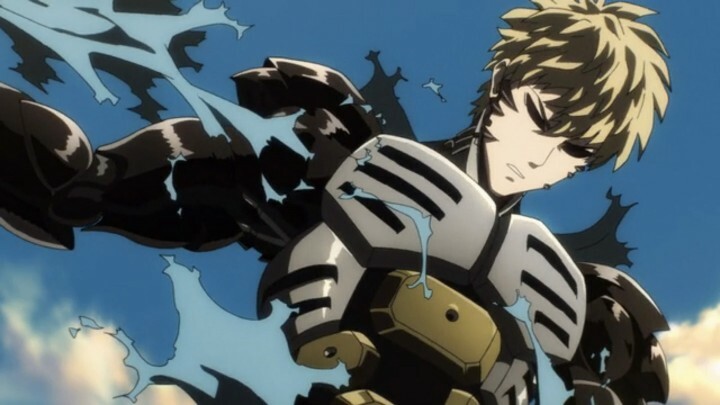 Genos does very little during this engagement aside from coming into a brief conflict with another hero, Metal Knight. This and other plots are left where they start: nowhere in particular. Unfortunately, there is no season 2 confirmed as of yet so I’m left to wonder why Madhouse bothered to include this obvious foreshadowing of future conflicts when there seemingly isn’t a future for this anime for their studio. One Punch Man is an anime for anime fans. It plays with our expectations at every turn by giving us a protagonist that’s seemingly like the others we’re already familiar with, and yet so different than he’s in a class of his own. 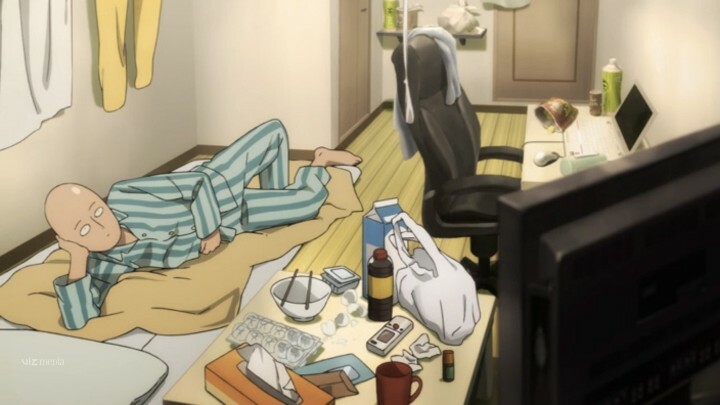 Saitama is both the perfect shounen protagonist and the perfect example of why such a person would be utterly depressed with his own existence if he ever existed. The fights are both beautifully animated and yet meaningless at the same time, at least at face value. This is an anime about fighting heroes that has little to do with the battles themselves. Rather, the strength of Saitama lies not in his physical dominance, but in his enduring spirit to somehow find a reason to fight despite the fact that he’s no longer entertained. With that in mind, Saitama is really the perfect hero, a man who is resolved to save people and cities “for fun” despite the fact that it stopped being fun long ago. 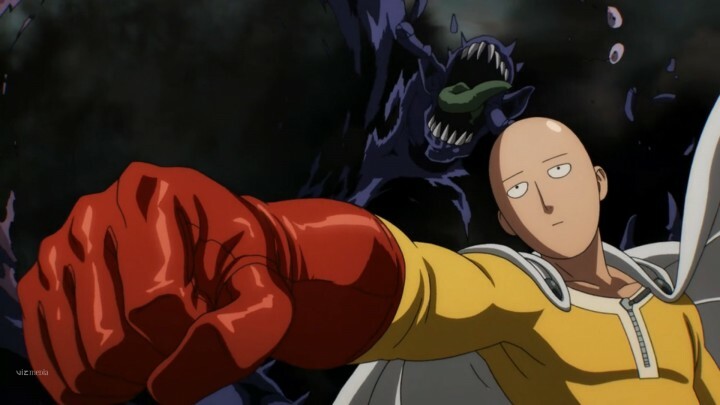 Somehow, in parodying the shounen anime genre with its tired tropes and heroics and physical strength, One Punch Man delivers a protagonist and story that surpasses the ones that it pokes fun at.